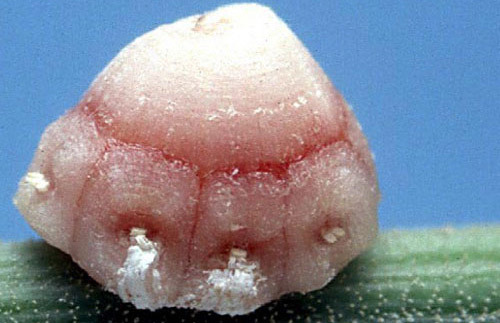 Although extensively distributed world-wide, the fig wax scale, Ceroplastes rusci (Linnaeus), was first discovered in Florida at several nursery and stock dealers in 1994 and 1995. It has been a pest of Ixora spp. and infrequently found on other host plants. Prior to the Florida discoveries, the California Department of Food and Agriculture had intercepted specimens from Florida. Figure 1. Adult female fig wax scales, Ceroplastes rusci (Linnaeus). Photograph by Doug Caldwell, University of Florida. Talhouk (1975) reported the presence of this scale in the Mediterranean region (Algeria, Cyprus, Egypt, Greece, Israel, Italy, Lebanon, Morocco, Spain, Tunisia and Turkey) and Argentina. (Ben-Dov 1993, CABI 2011, Vu et al. 2006). In North America, it appears that it is only established in Florida (United States) (Hodges et al. 2005). This scale is deeply encased in pinkish-gray wax, which is divided into three wax plates on each side with additional plates at the anterior and posterior ends. The single large dorsal plate has a central nucleus. Dorsal and lateral plates are separated from each other by dark red lines which are the color of the scale's body beneath the wax. The anterolateral and mediolateral plates have some white wax which indicates the stigmatic wax bands. Figure 2. Adult female fig wax scale, Ceroplastes rusci (Linnaeus). Photograph by Division of Plant Industry, Florida Department of Agriculture and Consumer Services. The biology of the fig wax scale has not been studied in Florida but has been described on fig trees in Israel (Bodkin 1927). In general, adult females overwinter on twigs and produce eggs very early in the spring. 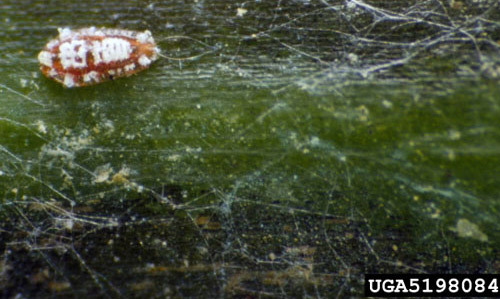 The eggs hatch to crawlers which move to feed on leaves. After about one month, the crawlers molt to 2nd instar nymphs and migrate to the leaf petioles or to new shoots. Maturity is attained in the summer, and a new generation of crawlers is produced. These nymphs mature late in the fall, overwinter on the twigs, and repeat the cycle (Bodkin 1927). Swailem and Awadallah (1973) reported scales to be equally present on both upper and lower leaf surfaces on fig trees in Egypt. Figure 3. Nymph of the fig wax scale, Ceroplastes rusci (Linnaeus). Photograph by Division of Plant Industry, Florida Department of Agriculture and Consumer Services. www.insectimages.org. The fig wax scale has also been found feeding on Citrus sinensis and Citrus reticulata in Greece (Argyriou and Mourikis 1981). In Florida, specimens of this scale have been identified on Annona squamosa (sugar apple), Mimusops roxburghiana (mimusops), Phoenix roebelenii (pygmy date palm), and Ixora spp. The fig wax scale has been reported as a pest of citrus in Italy (Talhouk 1975). Infrequent major local infestations in the citrus-growing areas of Italy have been controlled with refined petroleum oils (Barbagallo 1981). Similar outbreaks occurring in the Aegean Islands, Greece, have been controlled by the application of oils in the summer. Presence of the parasites Coccophagus lycimnia Walker (Aphelinidae) and Scutellista cyanea Motschulsky (Pteromalidae) aid in fig wax scale control (Argyriou and Mourikis 1981). Ben-Dov Y. 1993. 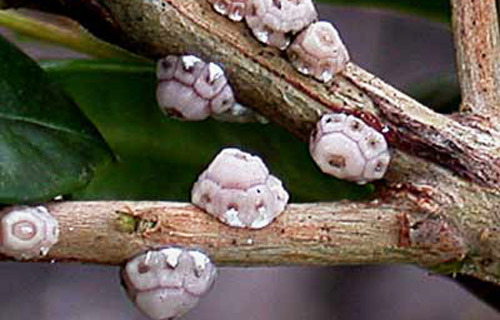 A Systematic Catalogue of the Soft Scale Insects of the World. Sandhill Crane Press, Inc., Gainesville, FL. Flora and Fauna Handbook No. 9. 536 pp. Bodkin GE. 1927. The fig wax scale (Ceroplastes rusci L.) in Palestine. Bulletin of Entomological Research 17: 259-263. CABI. (2011). Ceroplastes rusci. Distribution Maps of Plant Pests. (25 September 2012). Swailem SM, Awadallah KT. 1973. On the seasonal abundance of the insect and mite fauna on the leaves of sycamore fig trees. Bulletin de la Société Entomologique d'Egypte 57: 1-8. Talhouk AMS. 1975. Citrus pests throughout the world. Ciba-Geigy Agrochemicals, Basel, Switzerland. Technical Monograph No. 4. 21 pp. Authors: Avas B. Hamon (retired) and Gregor J. Mason, Florida Department of Agriculture and Consumer Services (FDACS), Division of Plant Industry. Originally published as DPI Entomology Circular 380. Publication Date: January 2001. Latest revision: July 2014. Reviewed: December 2017.